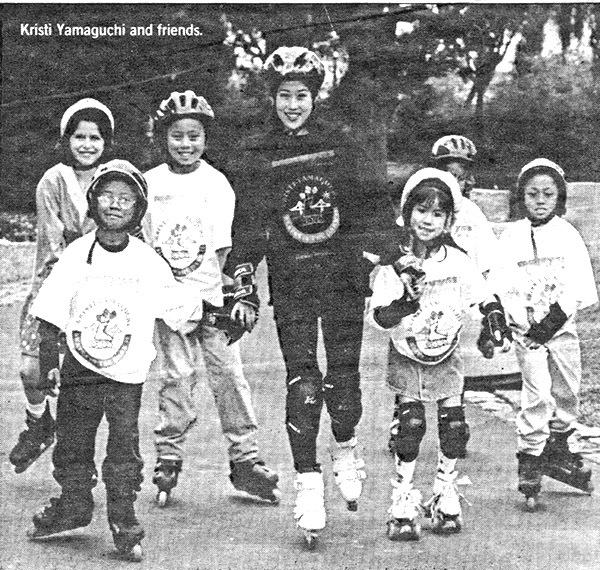 GET IN LINE What does a championship ice skater like Kristi Yamaguchi do when she's off the ice? Skate on land, naturally, and she's going to have plenty .of company at "Skates In the Park II." Joining Kristi will be pals Scott Hamilton, Peggy Fleming, Ronnie Lott and Bay Area kids and their families. The day's activities include a competitive l0 K challenge, recreational skating and a picnic in the park, with entertainment, clowns, balloons, children's games and more. Participants are asked to raise a minimum of $50 in pledges to benefit Yamaguchi's charitable foundation.